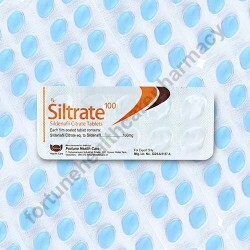 Siltrate 100 pills manufactured by Fortune Healthcare Ltd. are considered to be the most accessible and safest feasible solution for relieving impotence issue in men. The medicine is available in blister pack of 10 conventional tablets. Main active component Sildenafil Citrate 100 mg (Generic Viagra) is the best trusted solution for ED condition. This particular component in the medicine loosens arterial blockages and enhances flow of blood in the penile region. This complete action mechanism helps men to attain and maintain penile erection for longer time. Consume Siltrate 100 pill only once in a day with plain glass of water. Do not alter the state of pill by crushing or do not take the pill with fatty food, as such acts shall lower the effectiveness of this medication. Rashes, headache, dizziness, diarrhea, nausea, back pain are some common side effects that may occur while taking this pill. Mild effects with this pill are nothing to worry about as they do not stay for longer time. Overdose shall lead to severe effects like ringing in ears or hearing loss, loss of vision, chest pain or irregular heartbeat, shortness of breath or swelling in the hands.